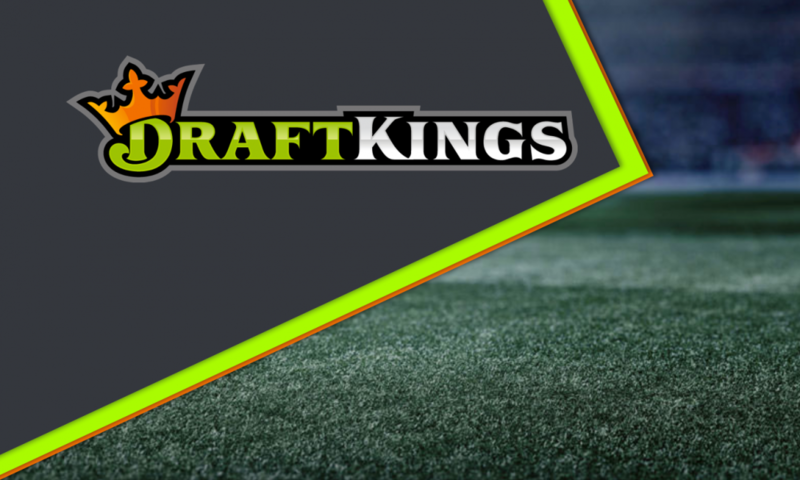 Throughout the 2017 CFL daily fantasy season, I have been logging a few different statistics I thought would be valuable to look at around the mid-way point of the season. Well, we’re basically here and I’m feeling like digging into one specific set of numbers I’ve been following: fantasy points allowed per position. I have logged how every team has performed against opposing team’s QB, RB, WR1 and WR2 this season and now have a large enough sample size to take a look and see what it tells us. Before jumping into the results, I will warn you that under my discretion I picked the WR1 and WR2s for the week. I do realize that it may have been more accurate to go by slotback and receiver positions, but with the way teams move their receivers around, I thought it was more beneficial to pick the top two positions per team regardless of actual position. While I don’t think that this impacts the study much, it is worth noting. Taking a look at these numbers shows us a few obvious things: Hamilton is God-awful and Edmonton’s defense is nothing to mess around with. Hamilton has given up huge points this season, giving up three of the top four fantasy performances by opposing quarterbacks (39.14, 38.78 and 38.4) and two of the top three performances from WR2s (30.7 and 29.1). For that reason we see them as the top team to target WR2s against. Guys like Bryant Mitchell and Duron Carter have fared extremely well against the Tiger-Cats “defense”. Edmonton’s defense has been quite stellar, giving up no more than 15.8 fantasy points to a WR1 or WR2 in 2017. They are very clearly the best against those two positions and we saw that this past week with Greg Ellingson and Brad Sinopoli generating 14.71 and 11.1 fantasy points respectively. Those two guys are studs and were held in check by Edmonton. Calgary has been quite impressive against opposing quarterbacks giving up an average of just 14.94 fantasy points per game to them in 2017. Their dominance has been amazing considering they’ve given up just 9.58 fantasy points to quarterbacks over their last five games. While the numbers may be a tad skewed (blowout against Hamilton in week six and facing Toronto’s backups two weeks ago), opposing quarterbacks scored a high of 15.84 over that stretch. Saskatchewan and Winnipeg are the top two defenses against the running back position, only giving up one game each where opposing running backs generated 20+ fantasy points. Besides those games, these two defenses have done great limiting running back scoring. Saskatchewan has faced the likes of Jeremiah Johnson (twice), Jerome Messam, Andrew Harris and Tyrell Sutton so they’ve definitely been tested. As for Winnipeg, they’ve faced an easier schedule, only facing William Powell, Jeremiah Johnson and Jerome Messam when it comes to tough opponents. These stats didn’t just allow me to look at how teams fared against opposing positions singularly. 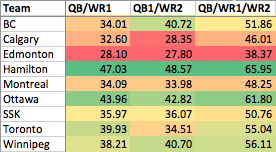 I was curious who the best and worst teams to stack QB/WRs against and here we have those numbers. As you expected, Hamilton is the best team to stack against by far. Ottawa’s 61.8 fantasy points allowed to QB/WR1/WR2 combinations is 4.15 fantasy points away from the horrible Hamilton “defense”. On the other end of the spectrum you have Edmonton and Calgary being the elite defenses when it comes to stacking. While the thought process behind this is pretty basic, it’s certainly worth keeping track of. Every defense has its weaknesses and after 7-8 games in a season it’s fairly easy to point those out. Going into week nine, these numbers suggest avoid Blue Bombers and Lions. They also suggest that maybe an Ottawa/Hamilton game stack is the key to winning and a mid-priced option like Brandon Whitaker might exceed his value by a decent margin against the worst defense against opposing running backs, Montreal. Have your own thoughts on this matter? Hit me up on Twitter at @RealestChrisKay and if you would like to troll @benyamen then please do so as well. Best of luck in week nine everyone!